Real Madrid's Karim Benzema scores their first goal. Real Madrid edged a 1-0 win over minnows Rayo Vallecano on Saturday, earning a third consecutive La Liga victory and rising to third in the table, but they again failed to sparkle and had to endure booing from their unhappy supporters. 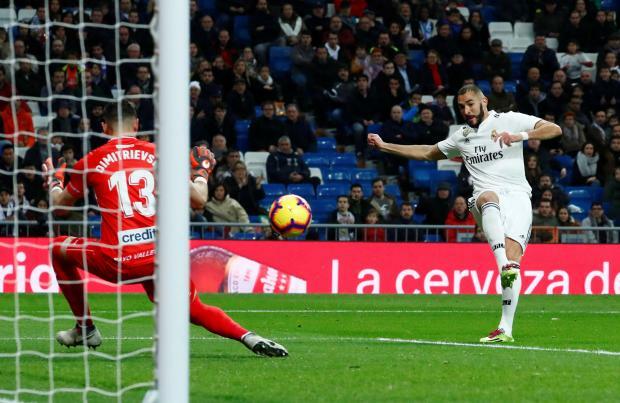 Karim Benzema beat a poorly constructed Rayo offside trap to score the only goal of the game in the 13th minute and Toni Kroos came close to doubling Madrid's advantage later in the first half when he struck a post from outside the box. The win put Santiago Solari's side up to third place in the standings on 29 points, one clear of fourth-placed Sevilla who host Girona on Sunday and two behind champions and leaders Barcelona, who visit Levante, and Atletico Madrid. Rayo defender Emiliano Velazquez came desperately close to equalising with a bullet header from a corner shortly after Benzema's goal.